Analysis of EGFP reporter activity in different myeloid and lymphoid cell types in vitro. A, IL-10–EGFP reporter allele of the ITIG mouse. An IRES-eGFP cassette was inserted by homologous recombination upstream of the 3′ UTR of the Il10 gene. B, BMDCs from WT and ITIG mice were stimulated 24 h with 500 ng/ml LPS or 50 μg/ml zymosan. Purified splenic CD4+ T cells from WT and ITIG mice were incubated for 3 d with anti-CD3, anti-CD28, with or without combination with the IL-10 inducers 4 × 10−8 M vitamin D3 (Vit D3) and 10−7 M dexamethasone (Dex). Purified splenic B220+ B cells from WT and ITIG mice were stimulated for 2 d with 5 M CpG ODNs. The data shown are typical results of at least three experiments. C, The amount of IL-10 in the collected supernatants of ITIB cells in B was measured using a CBA kit. The error bars show the SD. The data shown are typical results of at least three experiments. Detection of Bla reporter activity by fluorescence microscopy and FACS in different myeloid and lymphoid cell types in vitro. A, IL-10–Bla reporter allele of the ITIB mouse. Two copies of IRES-bla were inserted by homologous recombination at the end of the last exon and before the polyadenylation signal of the Il10 gene. B, PECs from ITIB mice were seeded on coverslips in a 24-well plate in RPMI 1640 medium alone or containing 5 μM CpG DNA or 500 ng/ml LPS. After 13 h of stimulation, cells were loaded with CCF4-AM and analyzed by fluorescence microscopy. Original magnification ×40. Bla− PECs are green, and Bla+ PECs show blue fluorescence. C, The amount of IL-10 in the supernatants of cell cultures in B was measured using a CBA kit. D, BMDCs from ITIB mice were stimulated 12 h with 500 ng/ml LPS or 50 μg/ml zymosan. Purified splenic CD4+ T cells from WT and ITIB mice were incubated for 3 d with anti-CD3, anti-CD28, with or without combination with the IL-10 inducers 4 × 10−8 M vitamin D3 (Vit D3) and 10−7 M dexamethasone (Dex). Purified splenic B220+ B cells from ITIB mice were stimulated for 2 d with 10 μg/ml anti-IgD or 5 μM CpG ODNs. CCF4-blue (blue fluorescent product of the CCF4-AM substrate) indicates Bla+ cells. The data shown are typical results of more than three experiments. ITIB mice enable kinetic studies. A total of 2.5 × 105 BMDCs from ITIB mice were seeded per well of a 96-well plate and incubated in 90 μl RPMI 1640 medium/5% FBS alone (nonstimulated) or containing 500 ng/ml LPS. A, Cell supernatants were collected at the indicated time points, and cells were loaded with CCF4-AM and analyzed by FACS. The amount of secreted IL-10 was measured in the collected culture supernatants at the different time points and plotted against the percentage of Bla+ cells (B) or the ratio of blue to green fluorescence of the Bla+ population that was normalized to the blue/green value of the corresponding Bla- population (C). The data shown are typical results of three experiments. ITIB, but not ITIG, mice track IL-10–expressing cells in the steady state in vivo. 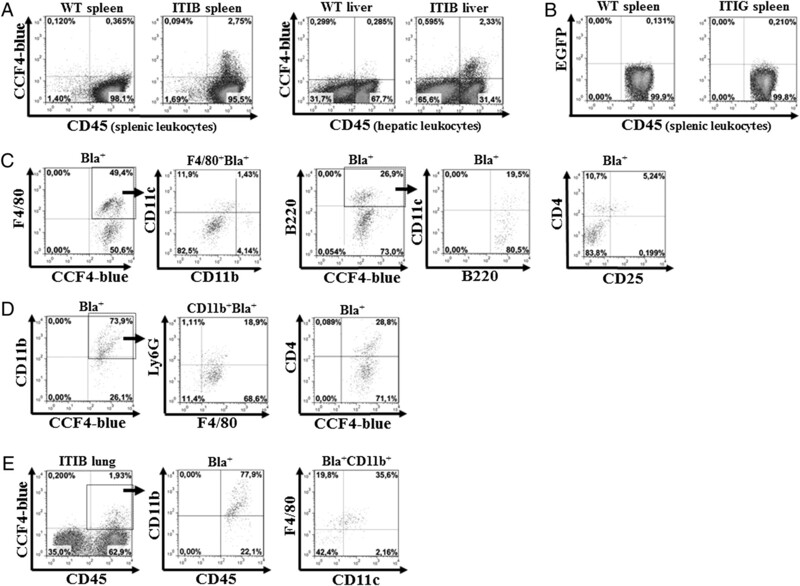 Flow cytometry analyses of splenic and hepatic leukocytes from naive WT, ITIG, and ITIB mice. A, Splenocytes and liver cells from ITIB and WT mice were loaded with CCF4-AM and subjected to immunofluorescence staining against CD45. Splenic and liver cells were gated on CCF4-blue and CD45. B, CD45+ splenic cells from WT and ITIG mice were gated on FITC (EGFP). The Bla+ splenic (C) and hepatic (D) leukocyte populations in A were gated on the indicated cell-type specific markers to determine the percentage of different cell types. E, Single-cell suspension was prepared from lung of ITIB mice, loaded with CCF4-AM, and subjected to immunofluorescence staining against the indicated cell-surface markers. Lung cells were gated on CCF4-blue and CD45 (left panel). The Bla+ lung leukocyte population was gated on the indicated cell-type specific markers to determine the percentage of different cell types. The data shown are representative of more than six experiments. Neutrophils and monocytes are the major IL-10 producer during infection with Y. enterocolitica. WT, ITIG, and ITIB mice were infected i.p. with 5 × 104 Y. enterocolitica and sacrificed after 5 d. Splenic single-cell suspensions from ITIB mice were loaded with CCF4-AM and subjected to immunofluorescence staining against the indicated markers for specific cell types. A, CD45+ splenic leukocytes were gated on CCF4-blue. 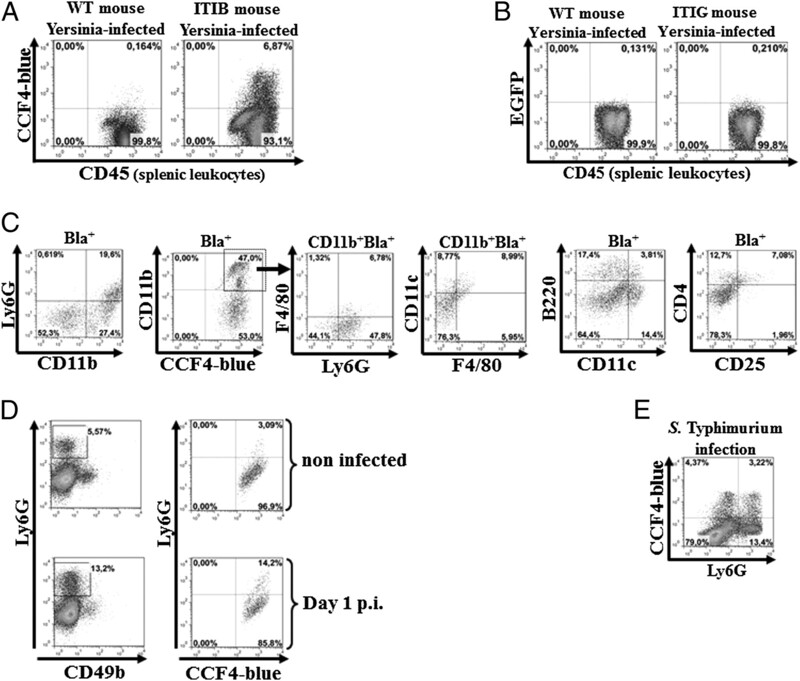 B, CD45+ splenic cells from infected WT and ITIG mice were gated on FITC (EGFP). C, The Bla+ splenic leukocyte population in A was gated on the indicated cell-type specific markers to determine the percentage of different cell types. D, ITIB mice were infected i.p. with 5 × 104 Y. enterocolitica and sacrificed after 1 d. CD45+ splenic leukocytes were gated on Ly6G and CD49b. One day postinfection, the percentage of Ly6G+ neutrophils increased approximately three times (left panels). CD45+ splenic leukocytes were gated on CCF4-blue and Ly6G (right panels). E, ITIB mice were infected i.p. with 1 × 104 S. Typhimurium and sacrificed after 5 d. CD45+ splenic leukocytes were gated on Ly6G and CCF4-blue. The data shown are representative of results obtained by using three to five mice. Characterization of IL-10–producing TILs. ITIB mice and WT littermates were s.c. injected into the lower dorsal quadrant with 2 × 105 B16-F10 melanoma cells. Two weeks later, tumors were removed, from which single cell suspensions were prepared, loaded with CCF4-AM, stained with Abs against immune cell surface markers, and analyzed by flow cytometer. Whole single-cell suspensions from tumors were gated on CD45 and CCF4-blue (left panel). The Bla+ TIL population was gated on the indicated cell-type specific markers to determine the percentage of different cell types. The data shown are representative of results obtained by using three mice. 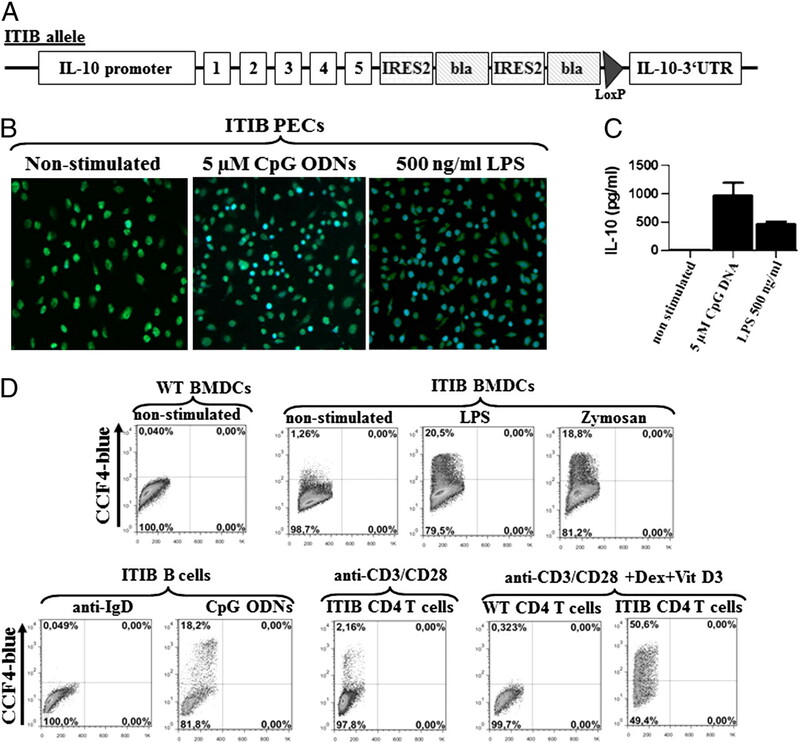 ITIB mice enable in vivo screening of cell type-specific IL-10–modulating reagents. ITIB mice were injected i.p. with 400 μg CD28 superagonist and sacrificed after 4 d. The spleens were prepared from nontreated and treated ITIB mice, and the splenocytes were loaded with CCF4-AM and stained with Abs specific for CD45, CD4, and CD25 and analyzed by FACS. Supplemental Figure 1: Generation of the ITIG reporter mouse. Supplemental Figure 2: Generation of the ITIB reporter mouse. Supplemental Figure 3: Stability, fidelity and specificity of Bla-reporter activity in vitro and in vivo. Supplemental Figure 4: Cellular sources of IL-10 in the spleen of naïve and Yersinia-infected ITIB mice.